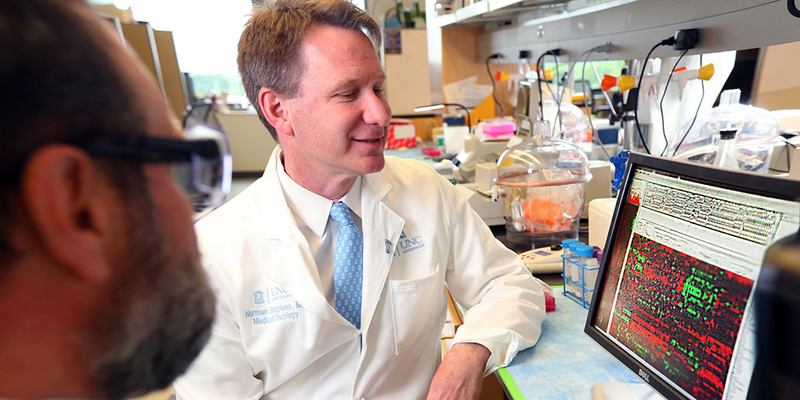 Norman Sharpless, MD, and colleagues reported in Nature Medicine findings from a preclinical study that demonstrated that a potential new drug effectively targeted a genetic mutation linked to melanoma and the most common form of lymphoma. In a step forward in the push for targeted treatments that can block the specific molecular malfunctions driving cancer, University of North Carolina Lineberger Comprehensive Cancer Center researchers have demonstrated how a genetic mutation can drive the most common type of lymphoma as well as melanoma, the deadliest form of skin cancer. The researchers reported in Nature Medicine today the description of new laboratory models of B-cell lymphoma and melanoma featuring a specific mutation of EZH2, a gene known to regulate cell fate. The authors also demonstrated that a new investigational inhibitor, JQEZ5, blocked the function of the protein made by the EZH2 gene, and that it was highly active in EZH2-driven cancer models. The specific mutation of EZH2 studied by the Sharpless lab is a relatively common event in diverse cancers, occurring in approximately 20 percent of B-cell lymphomas, 5 percent of melanomas and at lower frequency in a variety of other cancers, Sharpless said. This analysis suggests thousands of people in the United States develop cancer driven by this mutation annually. The researchers determined that a mutation in the EZH2 gene alone is sufficient to drive B-cell lymphoma, whereas in melanoma, the EZH2 mutation occurs in combination with mutations of the BRAF gene, which occurs in about half of melanoma patients. These findings have important implications for both treatment and further drug development, said the study’s first author George P. Souroullas, PhD, a research scientist at UNC Lineberger and the UNC School of Medicine Department of Genetics, as they indicate which combinations of drugs could be therapeutically beneficial. Specifically, their findings in melanoma suggest that inhibitors of the protein created by the EZH2 gene – like JQEZ5 -might work well in combination with inhibitors of BRAF, which are already approved by the U.S. Food and Drug Administration as melanoma therapy. And their findings suggest that EZH2 inhibitors could be an effective strategy in some patients with melanoma or B-cell lymphoma, he said. The researchers treated the newly developed laboratory models of melanoma and lymphoma with the specific EZH2 mutation with a variety of therapies, including different compounds designed to inhibit EZH2. The authors found that JQEZ5, a molecule recently developed by Jun Qi, PhD, of the Dana-Farber Cancer Institute, and James E. Bradner, MD, formerly of the Dana-Farber and now president of the Novartis Institutes for BioMedical Research, was highly potent in animal models of EZH2-mutant cancer. The authors showed that JQEZ5 had drug-like properties and minimal toxicity, suggesting such approaches may be of value in human patients with EZH2 mutant cancers. “This paper showcases the centrality of genome structure in the pathogenesis of cancer,” said Bradner. The findings are important as new treatments are needed for lymphoma and metastatic melanoma, Sharpless said. The study was supported by grants from the National Cancer Institute, the National Institute on Aging, the National Heart, Lung and Blood Institute. In addition to Bradner, Qi, Sharpless, and Souroullas, other co-authors include: Joel S. Parker of UNC Lineberger, Jeremy M. Simon of UNC Lineberger, Jie-Yu Liu of the UNC School of Medicine Department of Genetics and UNC Lineberger, Joshiawa Paulk of the Dana-Farber, Jessie Xiong of UNC Lineberger, Kelly S. Clark of UNC Lineberger, Yuri Fedoriw of UNC Lineberger and the UNC School of Medicine Department of Pathology and Laboratory Medicine, and Christin E. Burd of the Ohio State University Departments of Molecular Genetics and Molecular Virology, Immunology and Medical Genetics.